Integrated audio power amplifier and signal control system, audio controls/power amplifier/signal processing functions such as integrated system solutions. Using the most advanced integrated devices, by means of simple products, common features of complex systems, modular product design, architecture, building blocks flexible configuration, achieving a higher level of functional integration. Typical system consists of several components, versatile line complex, lots of points of failure, low reliability, the new system uses a modular design, omitting repeating functional units, each functional unit integrated as plug-in boards, flexible configuration, maintenance and quick. 1) omitted repeating functional units, single-chip processing. 2) bus structure, eliminating the external wiring, connect the input, connect the output ,no longer consider middle unit wiring, connection failure is greatly reduced. Host integrated emergency switch device/5 units amplifier/amplifier service switch/ Lightning arrester /COBRANET module/power module, used module structure, maximum degree improve unit density, optimization function configuration, latest of amplifier service switch monitoring control unit can effective system online working ability, ensure reliable work, 5 units amplifier used latest of d class technology, high efficiency, small volume, outputsignal better, amplifier work status LCD screen real-time displayed, fault alarm displayed, Setting status query displays, highly integrated, and highly intelligent. 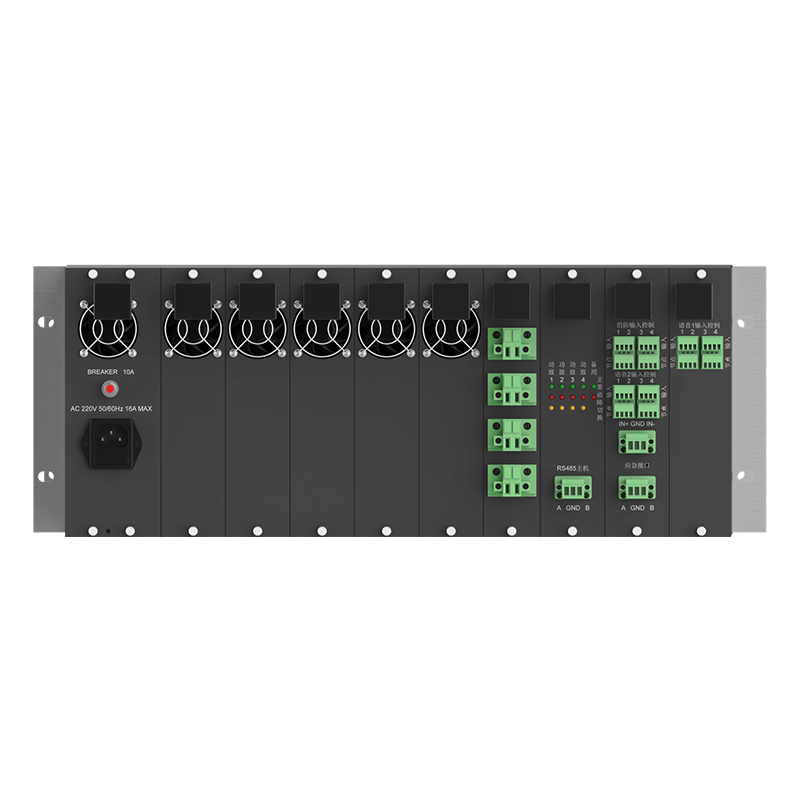 1) Integrated 5 amplifier units, 4 main 1 backup configurations, each module can be configured with 100W/300W/500W, standard 100V signal output. 2) Emergency switch module for integration, achieving 4-channel LINE1 input /LINE2 input 1emergency signal input/1emergency fire signal input, the fire emergency signal has highest priority, emergency signal as second priority, 4 types of input signals may be achieved through an external node based on priority configuration for signal output. 3) Amplifier service switch modules, achieving 4-channel main amplifier and 1 standby power amplifier, sync switch input/output, audio input signal/amplifier fault/switch success real-time indicate. 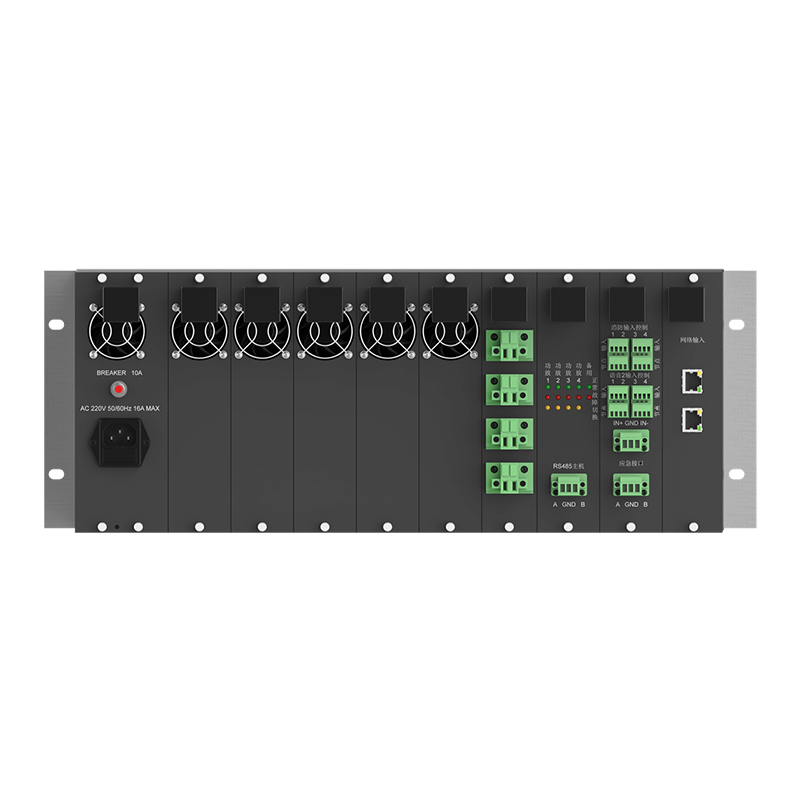 Automatic detection of input signal, automatic detection of output signals, real-time fault channels detection, automatic switch replacement, real-time status can be queried through the control bus. 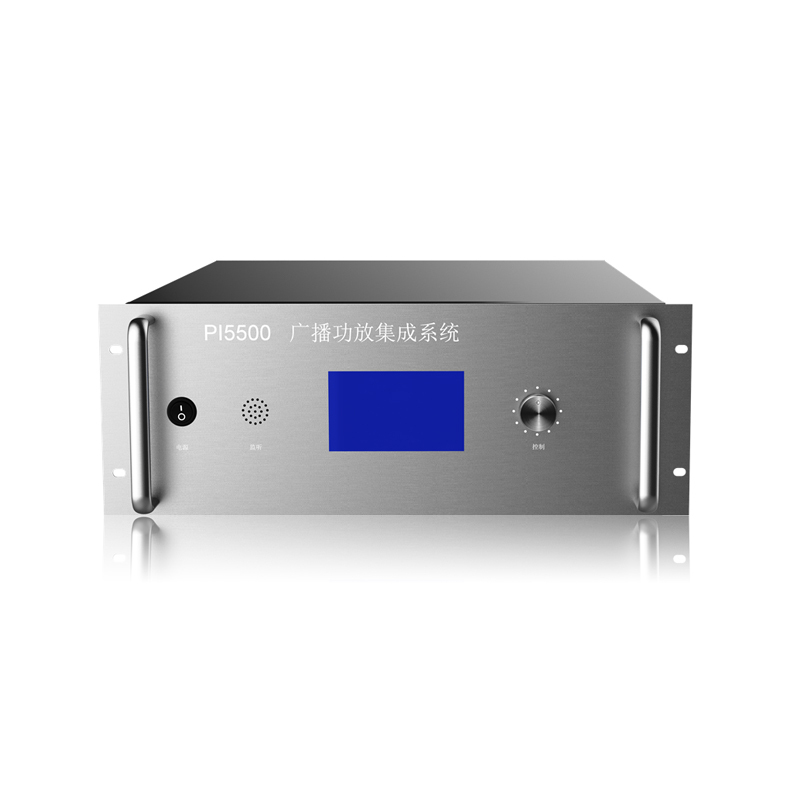 4) Power modules, reliable and efficient power supply unit meets 2000Wrms audio power, perfect protection function to ensure stability. 5) Lightning arrester module, 4 output power signal lightning protection using discharge tube TVS and hybrid, reliable lightning protection, integrated output filter circuits, providing high quality power signal output. 6) analog input module, 4-channel analog signal input and filtering, access emergency switch unit LINE1. 7) COBRANET module, this module 4-channel audio access, integrated CM2 module and the AD converter, can replace analog input module. 8) 110V or 220Vac 50Hz/60Hz AC power.